Buon Riposo lies in the heart of the Val dOrcia, now the most sought-after and the most photographed site in Tuscany (The English Patient landscapes and the Under the Tuscan Suns cover picture just to name the most popular). This valley was renowned since the end of the first millennium for being an important stage on the Via Francigena, the great medieval road from France to Rome that led pilgrims to the heart of Christianity. More than 20 castles and rest houses (ospedali) crowned the valley bordering the road. 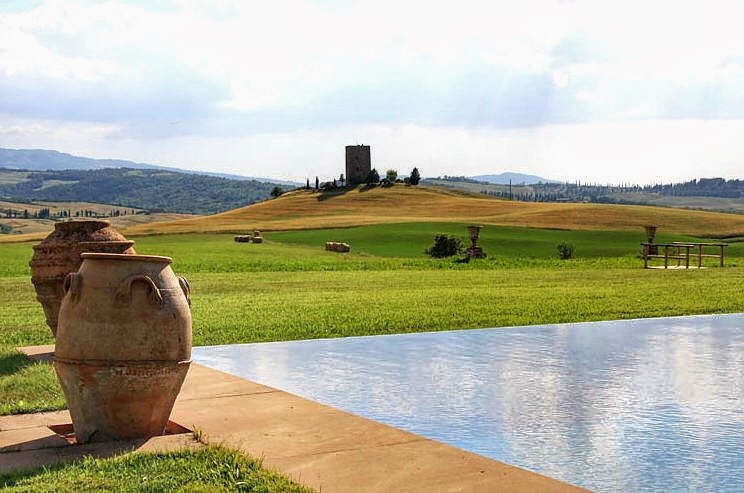 One of them, named Buonriposo (good rest), has become a vacation house for lovers of Val dOrcia. Rooms with beamed ceilings are well sized and opened to the most exciting views of clay hills, backed wheat fields, and gorse thickets, clay hillocks, and cypress trees. The decor of the house is very attractive. With the use of natural fabrics, antiques and whimsical pieces and touches, the owners have created beautiful and tasteful surroundings both pleasing to the eye and comfortable. Two-acre green lawn reaching the edges of the adjacent wheat fields;dining area for 20, in a sheltered cotta paved patio, with built in barbecue and ancient brick oven, leading to vegetable garden with herbs and season vegetables;14x6-m heated pool;large equipped underground dressing room with shower (hot water);cotta-paved pergola close to the pool facing a magic sunset view;2x2-m Jacuzzi hot tub in local stone, sits up to 16 persons with stunning west view over 11th century tower (lit at night) and castles. La dimora offers six bedrooms with double bed, alla with full bathroom. CONDITIONS - Vip Experience is reserved to clients of Residenze d’Epoca with VIP Coupon that will BOOK DIRECTLY at Dimora Buonriposo by 31/12/2019 in a superior room (NO base room). Dimora Buonriposo can guarantee Vip Experience for up to 2 guests (rooms) during the same period. Vip Experience does NOT include the costs of the stay. CONDIZIONI - The Vip Experience is reserved to Residenze d'Epoca clients in possession of a VIP Coupon, who will directly book a stay in a double superior room (NOT a standard room) at Dimora Buonriposo within 31/12/2019. Dimora Buonriposo will guarantee the Vip Experience to maximum two clients (rooms) in the same period. The Vip Experience doesn't include the cost of the stay. We have sent you a confirmation. We'll advice you when a "VIP Coupon - Complimentary" will be available (FREE for you, offered by Dimora Buonriposo). The phone number of Dimora Buonriposo is +39 3381156822.